The case is an aluminum mesh design that is nice to look at – but the “coolest” part about this cooler is the blue LED lights that illuminate the fan. You get your own personal light show every time you turn the cooling pad on! Additionally, the fan and the lights have separate On / Off switches, so you can switch them on and off separately. The cooler is meant for laptops from 10” to 17” (but can accommodate laptops a few inches over), so it covers nearly all laptop sizes. The unit itself is lightweight and has handles on either side for easy transportation, so it’s the perfect companion for your laptop. Another great feature of this pad is that the fan runs very quietly, much quieter than my laptop, and I constantly forget it is running. I have seen others state the fan gets louder as the cooler gets older – some people had trouble with noise 1 to 2 years in. I’ve had mine for about 3 months and have experienced no problems so far, so I cannot vouch for these claims. On other note, the cooler has 2 USB ports built in and runs off of USB power, so it actually gives you one more USB port than before, which is a neat feature. There is also a small storage drawer for the USB cable when it is not in use, making it easier to carry around. Overall this is a great cooler at a good price. 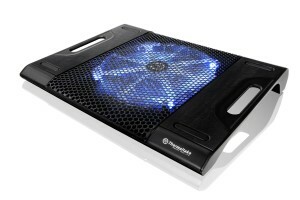 It has a huge fan and will chill your laptop down significantly, all while looking nice with the built-in blue LED lights and consuming very little battery power. 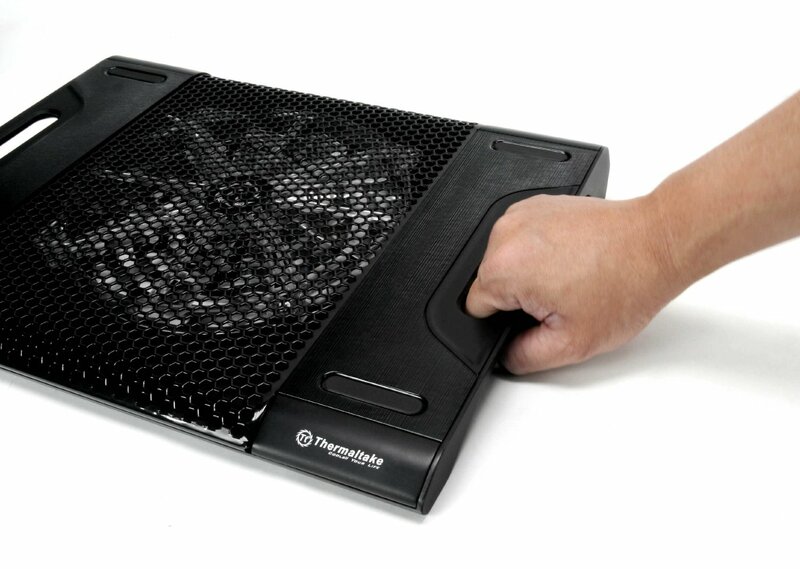 If you want a great notebook cooler with style and substance, a great choice would be the Thermaltake Massive23 LX . You can purchase the Massive23 LX from Amazon here, which I recommend. They almost always have the best prices and shipping is normally a steal. Thanks for reading!